Dr. Trimble works frequently with Klingele Vet Clinic in Quincy, IL, Four Paws Veterinary Care - Quincy, IL, and Advanced Veterinary Care located in Hannibal, Mo and several other vet clinics in the Tri-state area. 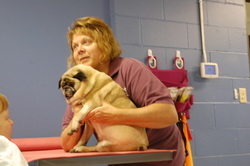 Klingele Vet Clinic in Quincy, IL also has a rehab center with a certified Rehabilitation Vet Tech - Jenna Lannerd. Rehab center has a underwater treadmill which is outstanding treatment for those animals with disc injuries, rehab from surgery or from a injury or accidents, builds stamina and benefits the older dog with arthritis. We are very excited to announce that we now have cold laser therapy for animals here at our clinic! This is a awesome modality to help with healing and decreasing pain. Therapy is $30.00 a session or 4 sessions for $100.00. Contract our office for more information! Dr. Trimble will be happy to meet you and your animal(s) at your vet if you prefer. Services available with concurrent Veterinary Care and/or referral only. Dr. Trimble is a Doctor of Chiropractic, licensed in the care of humans and certified in the care of animals. She has had extensive training in Animal Chiropractic. Dr. Trimble is NOT a Veterinarian, and cannot take responsibility for the primary care of animals.